Sky Assist is a provider of niche advanced software for the air transportation industry. BagAssist, Sky Assist’s vanguard solution, is an application that automates processes for the follow-up of lost and found baggage and is integrated with SITA WorldTracer™, the global standard for the tracing and recovery of lost luggage. 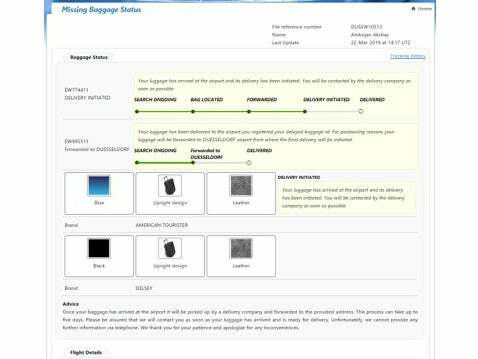 BagAssist Suite provides to airlines & handlers solutions covering all aspects of arrival services and lost and found. 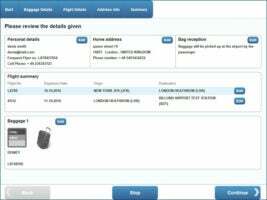 Produces all necessary messages, reports and labels needed for baggage tracing handling. Interacts with internal and external systems (DCS, airport, courier companies, Frequent Flyer database, etc) to pre-populate file fields, reducing significantly the agent input time and increasing security against fraud (self-service). 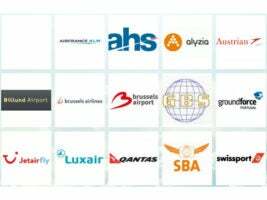 BagAssist is currently deployed by a mix of clients, including the airlines Air France/KLM, Qantas and Luxair, as well as ground handlers such as Alyzia, Billund Airport, GBS, Groundforce, SBA and Swissport. 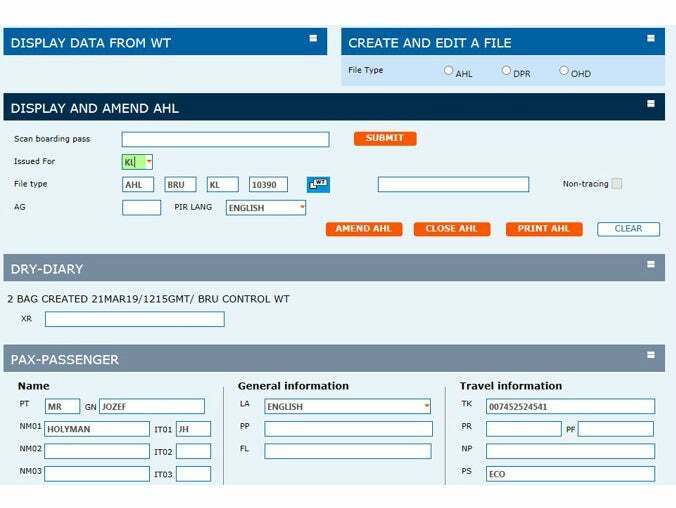 BagAssist agents’ application is a smart and user-friendly front-end product supporting, simplifying and automating SITA WorldTracer® management files. It improves the staff productivity and reduces the risk of human errors, thanks to process-driven and syntax validations, warning messages, mandatory fields check, etc. As such, it also decreases the staff training needs, improving staff flexibility and easing the use of temporary employees, mainly needed during peak periods. 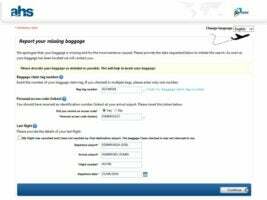 Thanks to its database, BagAssist can still be used during WorldTracer downtime. 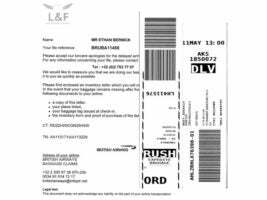 Using BagAssist, tag labels can be automatically printed for rushed luggage, received bags, bags to be delivered and on-hands easing the identification of the bag. 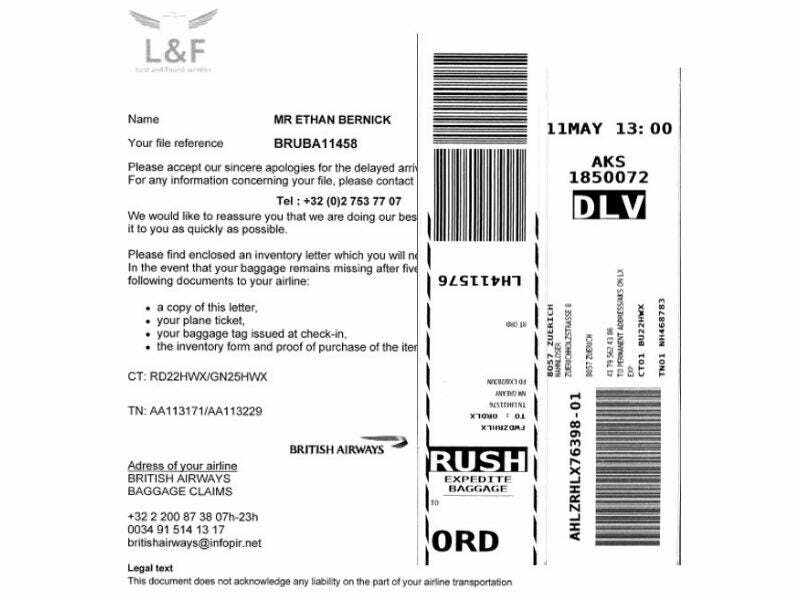 From BagAssist, print-outs for passengers and delivery companies are also generated. BagAssist is configurable using the application BagAdmin, allowing to personalize the application behaviour, customise the print-out texts and generate reports that can be exported to PDF or Excel. 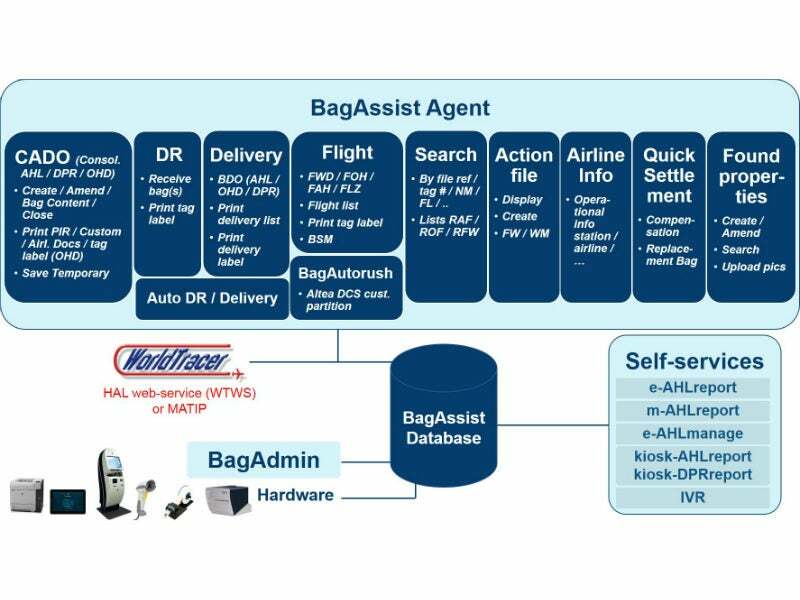 To a DCS, delivery companies, airport system, BSM or other systems, BagAssist can be connected over web-services to ensure communication with third-parties systems (retrieve flight lists, alert delivery companies, send BSM, etc). BagAutorush module is designed to handle early, late, not-sorted baggage in a fast and effective way by checking if the bag can still be loaded on the passenger flight. If not, an automated rushing procedure is started, producing all necessary messages and baggage labels in order to forward the bag in the fastest way to its final destination. 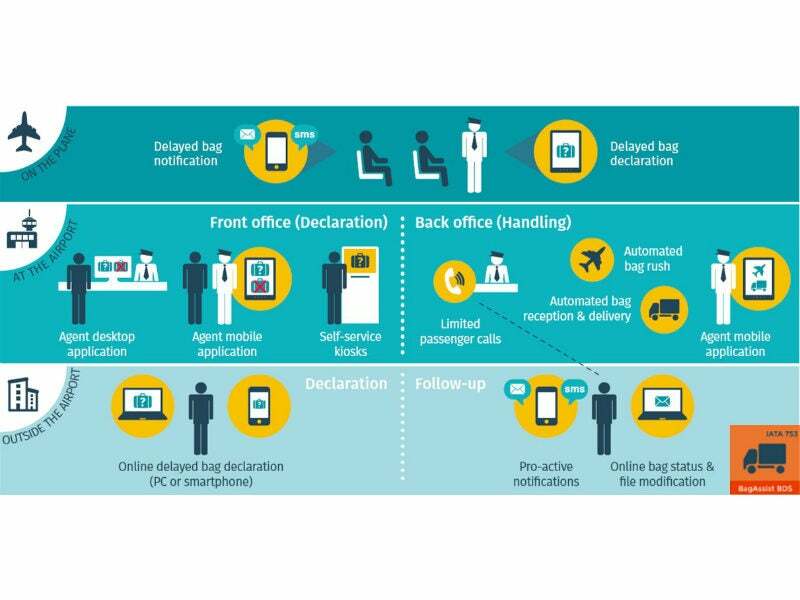 To offer passengers flexibility and autonomy, BagAssist Suite contains self-service products also relieving the agent workload during peak times. 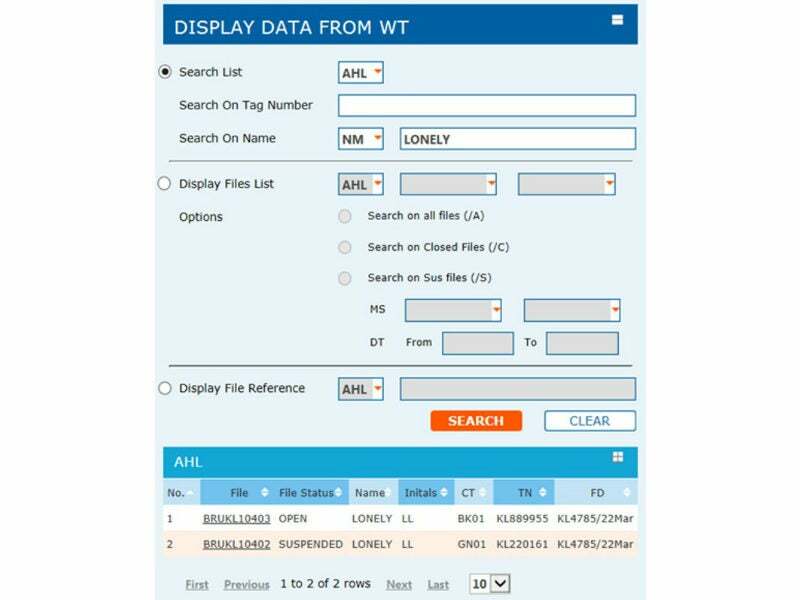 Passengers can report their missing bag from anywhere via Internet (e-AHLreport), via their mobile (m-AHL report) or at the airport via a kiosk (kiosk-AHLreport). 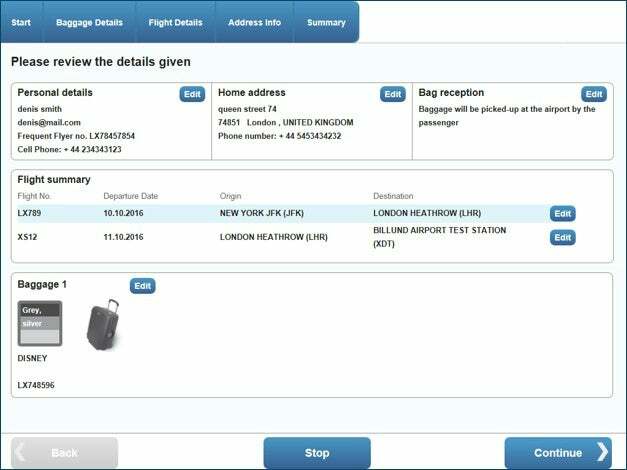 After, they can follow-up their bag status online and receive automatic updates via e-mail and/or SMS (e-AHLmanage). Self-service applications can be run as sub-modules of BagAssist or independently (except for IVR and e-AHLmanage that require files to be created in BagAssist, kiosk-AHLreport or e-AHLreport). Part of BagAssist Suite, there is BagAssist BDS which provides baggage delivery solutions to courier companies and accurate information of the baggage incident to passengers and airlines. 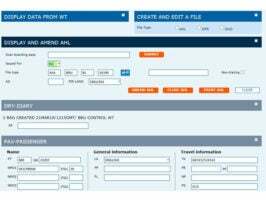 Also available for airlines, there is PaxClaims; the web-based automated system for claims management in an airline Customer Relations department. Sky Assist is organising its annual BagAssist user conference to be held in the Van Der Valk hotel, Brussels, Belgium. Being a ground handling company dealing with arrival services lost and found is nowadays not easy if you want to offer good services to handled airlines and stay profitable. 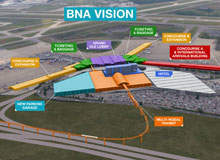 With annual passenger traffic of more than 12 million, the Nashville International Airport (BNA) is one of the busiest airports in the US. Being a ground handling company dealing with Arrival Services Lost & Found is nowadays not easy if you want to offer good services to handled airlines and stay profitable. Like each year Sky Assist will be present at the exhibition and conference organized by GHI in Barcelona, Spain, from 27 until 30 November 2017. Like each year Sky Assist represented by Luc Trentels (managing director) will be present at the WorldTracer user conference organised by SITA in Las Vegas, US, from 6-8 November 2017. For the 14th time, Sky Assist organises its annual BagAssist user conference to be held in Brussels on 20 and 21 June 2017 in the Van Der Valk hotel, Brussels, Belgium. 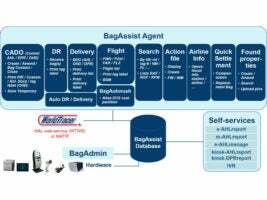 Sky Assist decided in late 2015 to start developing from scratch its BagAssist core application for agents. The main reasons were that, even though BagAssist has been coded as a web-based application, technology has heavily evolved since the first modules were available in 2002, implying technical constraints like limiting application mobility to other browsers than Internet Explorer, responsive design, time response optimisation and heavy maintenance. This year, Sky Assist product manager Eric Stessels will be present at the exhibition and conference organised by GHI in Copenhagen, Denmark, from 28 to 30 November 2016. Sky Assist, represented by Luc Trentels (managing director), will be present at the WorldTracer user conference organised by SITA in Shanghai, China, from 31 October until 02 November 2016. In mid-2016, Sky Assist upgraded its e-AHLmanage solution by allowing each handler to configure when and whether data are retrieved from World Tracer or from the BagAssist database. This new feature opens a lot of new opportunities for e-AHLmanage. Until recently, passengers coming to pick-up their delayed baggage at Brussels Airport had to access the lost and found offices via the same way than the passengers exiting the arrival area. m-AHLreport is our new mobile application for passengers to declare their missing bags on their smartphone. 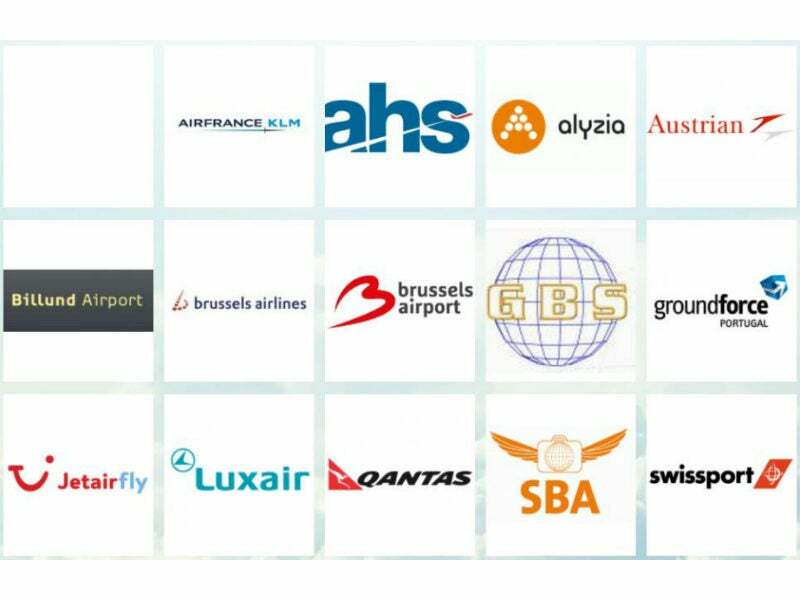 e-AHLreport is already used by several of our customers (Air France KLM, Swissport, SBA) for some years. During mid-2014, we developed m-AHLreport, the mobile version of e-AHLreport in collaboration with Air France. Interview: How to Speed Up the Handling of Early, Late or Unsorted Bags? At Sky Assist, communicating with the operations at arrival services and customer relations is critical: it helps us developing our solutions in line with the industry's needs. On a regular basis, we discuss one-to-one with our customers to share their personal experience of our products. During the first two weeks of November, SkyAssist will take part in two international industry events to spread the latest news about ground-handling operations and meet new and existing customers. A Boost in Mobile Usage? The Airline IT Trends Survey from SITA forecasts a boost in mobile usage for the coming years. "A smooth and hassle-free journey where passengers do not have to break stride from the curb to the gate, unless they choose to, is the goal: that would deliver tremendous value to passengers." explained Transport Association's (IATA) chief executive Tony Tyler at its 2013 World Passenger Symposium. Summer is a great season to travel! So we thought that we would make you travel by showing you where in the world BagAssist and the self-service applications are used. You will see that our BagAssist community is very international. At Sky Assist, communicating with the operations at arrival services and customer relations is critical: it helps us developing our applications in line with the industry’s needs. For this reason, we renewed our website, created a community portal for our BagAssist customers and joined the conversation on LinkedIn. SITA has published its yearly baggage report and announced an overall increase in performance. In February 2014, we updated Sky Assist company page on LinkedIn. It now contains a presentation of Sky Assist and a description of each of our products and services. Based on the data of several of our customers using self-service products, we have been able to extract some general statements regarding the use of self-service applications. During the last BagAssist user conference, held for the company 10th anniversary in Amsterdam, Holland on 27-29 May 2013, the BagAssist community did participate to a survey to rename the self-services applications for passengers originally called OnlineAHL, OnlineDelivery and PaxAHL. 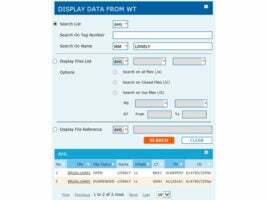 Sky Assist strengthens its partnership with SITA by signing a web service development agreement for WorldTracer. Since few months, SITA has built WorldTracer connectivity using web services, allowing product providers like Sky Assist to develop and test applications connecting to WorldTracer. Many efforts have been made the last decade to enhance passenger experience through self-service offers, but mainly in pre-departure area only like online check-in, self-baggage tagging or self-baggage drop. 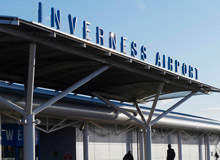 However passengers claim interest for more initiatives in that sensible part of the journey too, seen as the second factor in having an (un)pleasant journey. Ground Handling International magazine will be holding the 15th Annual 2013 conference in Spain. Sky Assist is participating to this event for the 9th time for promoting BagAssist, the web-based suite of products automating the primary baggage tracing process for lost baggage with special focus on self-services applications. Sky Assist will be at WorldTracer conference as BDS customer and WorldTracer web services developers, and will also be present as exhibitor with a stand. Find us 4 - 6 November 2013 in Ho Chi Minh City, Vietnam. Sky Assist will be holding a stand at the 2013 WACRA (Worldwide Airline Customer Relations Association) in Chicago, United States. 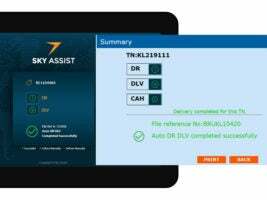 Sky Assist will promote PaxClaims, the web-based product for airline complaint management of an Airline Customer Relations department & Refund, the web-based product for airline ticket / coupons refund of an Airline Finance department. On May 1st 2013, Sky Assist became IATA Strategic partner in Baggage Services area. This is one more step forward in the company recognition as major niche player in baggage services area, with specialisation in lost and found delayed baggage services. Ground Handling International magazine will be holding the 14th Annual 2012 conference in Italy. Sky Assist is participating to this event for the 8th time and will be promoting BagAssist. Sky Assist will be holding a stand at the 2012 WACRA (Worldwide Airline Customer Relations Association) in Kuala Lumpur, Malaysia, from 23 to 26 September 2012. Qantas went live at the beginning of June 2012 with the mishandled baggage BagAssist kiosk PaxAHL application at Brisbane, Melbourne, Perth and Sydney airports. The delayed bag passenger declaration system uses an airport kiosk as an alternative to passengers queuing at the agent's desk. Swissport International, the world's leading provider of ground services to the aviation sector, has launched a state-of-the art self-service solution for passengers arriving in Geneva that increases the quality and efficiency of missing bag reporting. In these difficult industry times, lost and found departments are often under-staffed and often don't have any real flexible way to add untrained people as the processes and applications are so specific and complex. Therefore, any small incident can easily create chaos to baggage services and take days to recover with frustrated staff facing angry customers. 2nd BagAssist User Conference, 12-13 April 12005, Brussels, A Great Success! !